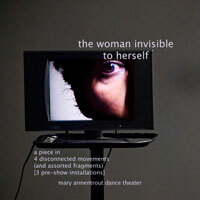 the woman invisible to herself is Mary Armentrout Dance Theater‘s acclaimed “solo” show that explodes both the notion of self-identity and the usual proscenium model of dance theater – meaning it is both a site specific performance installation in and around the old Sunshine Biscuit Factory in Oakland, as well as an autobiographical “solo” show with three other people playing also playing the title role, since this is a self that can’t be kept in one piece. Mary Armentrout Dance Theater 2010, 2011 at the Sunshine Biscuit Factory, full length documentation edit. Sound: Original Scores by Pamela Z, Evelyn Ficarra. Additional music: Beethoven. My work on the project featured a series of time-lapse installation films and live video work fitted into the unique spaces of the Sunshine Biscuit Factory. This show has now had two sold out runs in 2011 at the Biscuit Factory, and has got Mary a nomination for an Izzy (the bay area’s Isadora Duncan Dance Awards) for choreography.